A mining right is a powerful, and not commonly understood, concept that is all too often watered down by agency regulatory interference and exacerbated by the lack of knowledge from most of the mining community in the 21st century. This right to mine is an action also referred to as a “right of self-initiation.” This right to mine is an action (prospecting and extraction), as distinguished from idle ownership. Very few people understand the difference between a right (granted by Congress under statute) as distinguished from a permit (granted by an agency through regulation). One’s right to choose to actively engage in mining stems from the 1866 and 1872 mining law grant from Congress (codified at 30 U.S.C. sections 22-54). As an example, the Forest Service is a creature of an act of Congress charged with the responsibility and stewardship of the National Forests and the Deptartment of Interior was charged by Congress to manage the rest of the public lands. The miner or miners operating under the Mining Act should operate on a level playing field just as the Forest Service is on a level playing field with the BLM and Park Service. Have you ever heard of the Forest Service telling the BLM that they cannot do their job? In other words, can the Forest Service tell a miner he cannot mine on land open to mineral entry? The answer is “no.” Can they ask to help mitigate the surface impacts? Yes (according to the 9th Circuit Court), so long as their actions do not unreasonably prohibit, hinder, or clash with the miner’s property right to mine (see 30 U.S.C. §612(b)). The same interaction can apply to state agencies and their interplay with the miner on federally managed lands if the state agency has a memorandum of understanding with the federal surface management agency such as the US Forest Service (see 16 U.S.C. §559g(c)). In short -- a state or federal agency action and its associate approval that is optional. In other words, the agency has the authority to grant a go ahead or deny it. Why is this “discretionary” agency action language so important? Answer: because environmental laws only apply in this setting, namely the National Environmental Policy Act (NEPA-federal), the Endangered Species Act (ESA), California Environmental Quality Act (CEQA-state), and the Clean Water Act. More importantly, is the miner subject to discretionary agency action in a true permit scenario? The answer is “no,” unless the miner willingly consents to it in writing, thereby waiving an unlawful jurisdiction by the agency. The miner has the right to mine, therefore rendering any other agency relationship to one of non-discretionary advisement and notice, which is a huge distinction as compared to a discretionary permit. This distinction is very important in light of the ongoing California Dept. of Fish & Game (DFG) and Karuk litigation. Apparently the mining community has forgotten the important points in the Karuk v. Forest Service case where the tribe had lost and has now overcome primarily because the miners failed to point out to the court (in the DFG cases) and fully understand the power of the mining right and the fact the DFG’s relationship with the miner is non-discretionary in character, that by definition should not consent to a permit system. A permit system has been allowed to exist by the willing consent of the permittees. Those individuals dredging under the federal mining law upon federally managed lands open to mineral entry are exempt from a permissive system like the one set up by DFG. However, if you label yourself a recreationalist dredger instead of a miner, or are on private or state lands, you are subject to the DFG permitting scheme. Unfortunately, in June of 2012, the 9th Circuit (en banc) ruled in Karuk v. Forest Service (681 F.3d 1006) that the Forest Service is exercising discretion in processing a Notice of Intent, ignoring 30 years of precedent and standing the rule of law on its head. This 9th Circuit ruling erroneously means that there is no significant difference between a decision not to act and an affirmative authorization. In holding that a miner's submission of an NOI triggers section 7 consultation under the ESA, the majority discourages miners from discussing their proposed activities with the Forest Service to voluntarily reduce their impact on the environment, and rather encourages miners to make their own determination that their activities are not likely to “cause significant disturbance of surface resources,” (36 C.F.R. § 228.4(a)) and thus no NOI need be filed. This is not the first time the 9th Circuit has created law out of thin air and ignored the U.S. Supreme Court. “Agency discretion presumes that an agency can exercise “judgment” in connection with a particular action. See Citizens to Preserve Overton Park, Inc. v. Volpe,401 U.S. 402, 415-416, 91 S.Ct. 814, 28 L.Ed.2d 136 (1971); see also Random House Dictionary of the English Language 411 (unabridged ed.1967) (“discretion” defined as “the power or right to decide or act according to one's own judgment; freedom of judgment or choice”). As the mandatory language of § 402(b) itself illustrates, not every action authorized, funded, or carried out by a federal agency is a product of that agency's exercise of discretion. Generally speaking, when this prohibition scenario occurs, the agency is usually violating their own rules and federal statute. Miners must press the agencies and the courts with this question: Where do the mining rights end (Under the Mining Acts 30 U.S.C. §22 – 54) and the regulatory obligations begin? And in the case of the Forest Service: What is significant surface resource disturbance? The distinction between "reasonable regulation" and "prohibition" offers locators an avenue to resist the application of rules that severely impact their operations, but the miner must assert unreasonableness at the outset and pursue those objections through agency and judicial review processes. And, as in other instances, intricate semantic arguments seldom prevail if an ordinary, common sense interpretation is available. 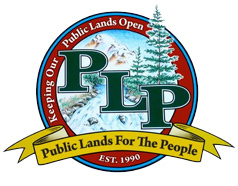 At this point it is recommended that the miner contact Public Lands for the People to help the miner wade through the process effectively and to challenge the problem agency in a lawful manner. There are many more cases that make reference to the distinction between a right under the mining law and a permissive system, but miners will lose cases unless this concept is fully understood and exercised. It is fair to say the miner does not have an unfettered right to mine irrespective of substantive environmental consequences - as was pointed out in the infamous 1884 Sawyer decision that banned hydraulic mine debris. Presently, it is this writer’s opinion that environmental laws were written not to apply to non-discretionary agency advisements that encompass mitigation recommendations, which are commonly misunderstood and accepted as a permit system of today.